Grandson of revered spiritual leader Rabbi Ovadia blasts Shas chairman's claim that his grandfather instructed him to abstain on Oslo vote. 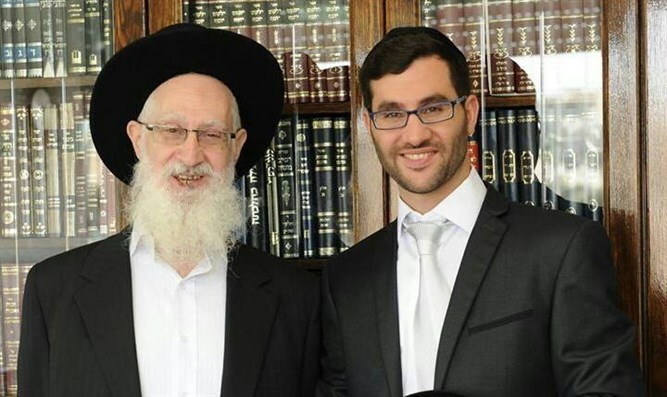 Rabbi Yehonatan Yosef, the grandson of Rabbi Ovadia Yosef, sharply criticized the remarks made by Shas chairman Aryeh Deri, who said in an interview with Army Radio that the order to vote for the Oslo Accords was received from Rabbi Ovadia. "We have explicit recordings of my grandfather, Rabbi Ovadia Yosef of blessed and righteous memory, and his clear statements that it was Aryeh Deri who dragged him to support the Oslo Accords. I am sorry that in the Sephardic and general public people believe a convicted criminal and not my grandfather, Rabbi Ovadia,” said Yosef. "Today everyone knows that the gloomy predictions of my father Rabbi Yaakov Yosef, of blessed and righteous memory, about the Oslo Accords turned out to be correct. Even though he paid a heavy price with ugly personal persecution in the face of his opposition to the bloody agreements, father was not afraid to express his opinion, that of the Torah, and so do I, the small one, especially when they harm grandpa, father and their heritage." Yosef, who serves as Eli Yishai’s representative in a unity faction headed by Aryeh King which is running for Jerusalem city council, also said, "Everyone knows that when Eli Yishai was close to my grandfather, Rabbi Ovadia published an emotional letter to the settlers of Judea, Samaria and Gaza, in which he explicitly wrote that the ruling he gave about ‘Land for Peace’ is not valid at all and the Oslo agreement is null and void. " "He also vehemently opposed the Disengagement, including strong opposition to the evacuation of isolated settlements such as Netzarim," Yosef said. "Even in the case of a ruling relating to territories in return for peace on the ground, we saw that by the day of his death, he had instructed Shas representatives to oppose any concessions on territories. My father and I strongly opposed the Oslo Accords. Who knows how many Jews would have been alive if Aryeh Deri would have bothered to knock on the government's table and oppose the agreement. It is unclear to every thinking person how the illusion agreements, with their many dangers, such as giving thousands of rifles to Palestinian policemen and bringing thousands of murderers from Tunis to the Land of Israel, did not cause him to rise up and warn of the danger posed to millions of Jews,” Yosef concluded.